Proper training can be expensive, and training with the wrong ammunition is an error few shooters can afford to make. 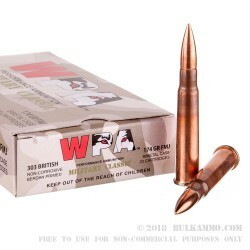 The Wolf 174gr .303 Performance Ammunition Full Metal Jacket is renowned for its affordability and consistency, and is engineered to help you stretch your dollars further than ever before. The Wolf 174gr .303 WPA FMJ cuts costs without cutting down on performance. 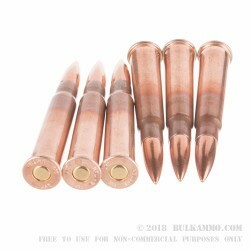 The thick bimetal copper-steel jacket provides consistent accuracy well out to 500 yards and beyond. 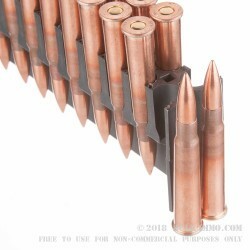 Steel cartridges offer identical chamber pressures to the their brass counterparts at less than half the costs, and allow the savings to be transferred from Wolf directly to you. 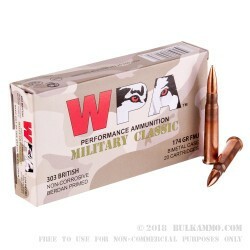 Non-corrosive box style primer are included in every round, and at a price point even the highest of volume of shooters can afford to fire, the Wolf 174gr .303 WPA FMJ is everything that you need in a performance range ammunition, without all the fanfare that you don’t.